It is with great pleasure that I introduce the Foundation for Science, Technology and Civilisation (FSTC), a not-for-profit company dedicated to using the historical roots of scientific inventions and innovations to enhance social cohesion and inter-cultural appreciation in a non-political and non-religious environment. During the latter years of being a Professor of Mechanical Engineering at the University of Manchester Institute of Science and Technology (UMIST), I became interested in the history of science and technology. 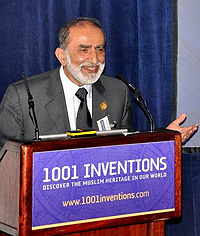 Fostering an accurate understanding of the thousand years of exceptional advances in science, technology, medicine and the arts made by men and women within the Muslim World from the 7th century onwards. Generating social cohesion, cultural awareness and respect through the exploration of Muslim and World heritage and how it is woven into our global society and civilisation – so that we all share and benefit from this heritage. Promoting science and learning as an alternative to negative or extremist behaviour. Via a large network of academics and experts, FSTC has successfully spread its message globally through many educational initiatives. These include touring exhibitions, academic and popular websites, teaching materials, films, social media campaigns, academic networks and numerous publications. FSTC is all about networking, sharing resources, and promoting our noble mission by tapping into the good will and generosity of our members, associates and partners. I hope that your experience with this website will be a refreshing journey back to the past to build a better future. I sincerely hope that you will be inspired by our initiatives and aspirations. Your thoughts and ideas are most welcome. This image is under a free license, Creative Commons - CC BY 4.0.